A navigation and timing signal intended for use by government agencies, armed forces and "blue light" services, PRS is designed to be available and robust even in times of crisis. Brussels says the UK cannot immediately have access to it when it leaves the European bloc because it will become a foreign entity and PRS is for EU member states only.The UK has accepted that its officials should not be part of the administrative elements of the programme but is insisting British companies should be allowed to bid for contracts and that base stations should still be located in British overseas territories such as the Falklands. A document given to EU officials during Brexit talks this week states "excluding industrial participation by UK industry in security-related areas risks delays of up to three years and additional costs of up to €1 billion". 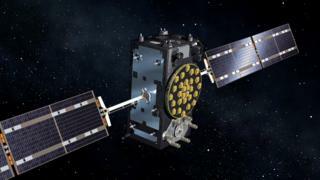 "It will not be straightforward to effectively fulfil all Galileo security work elsewhere," it says. "The UK therefore has a strong objection to its ongoing exclusion from security-related discussions and exchanges pertaining to the post-2019 development of Galileo and the PRS, which serves to limit UK assurance in the programme and discourage UK industrial participation. "Current EU restrictions on UK participation will have implications for the ceiling placed on future UK-EU security cooperation. "Separately, the UK has outlined the extent of existing law enforcement capabilities which would be lost if a bespoke security deal is not agreed after Brexit.According to details of a presentation seen by the BBC, the UK says there will be "significant gaps" in a wide range of areas including prisoner transfers, asset recovery, sharing of financial intelligence, victim compensation and access to criminal records for child protection vetting.